It can add a live chat room to SocialEngine. And the best part is that a free hosted chat will be assigned to your SocialEngine, once the module is successfully installed. It adds a live chat room with sixteen skins into SocialEngine, the users will able to single sign-on. Firstly a chat button will be added to the top menu of SocialEngine. Install the module, and the SocialEngine user database will be immigrated to the chat room and single sign-on will be enabled. It's all automatic! Then SocialEngine users may click the "Chat" button directly, without being asked to login again. The following data of the chat room can be displayed at the bottom SocialEngine page to attract more users to join chatting. 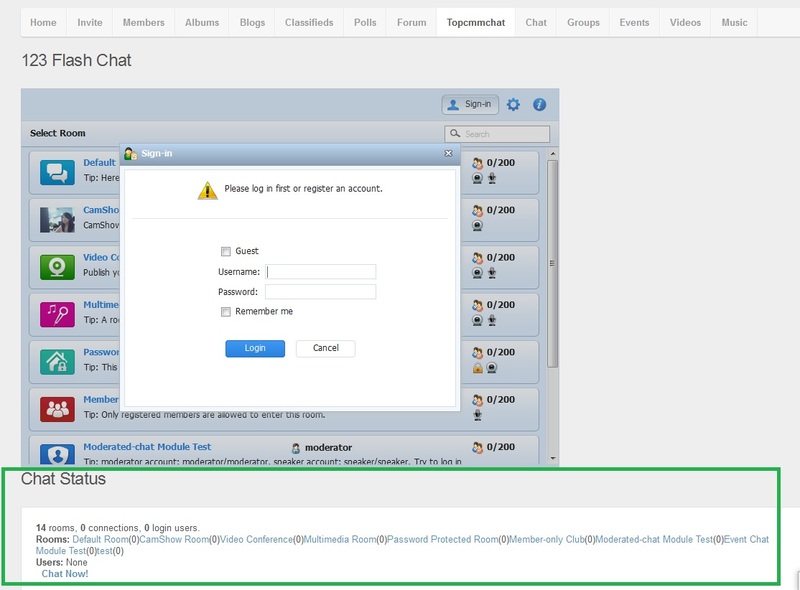 SocialEngine ACP-> Plugins -> 123 Flash Chat, enter the setting panel of the module. There is a new mobile App available now for 123 Flash Chat users. It is accessible for iPhone, iPad and Android devices users. Two open modes: embedded or popup. The latter one is more popular among SocialEngine users. Users integrated: SocialEngine users access accounts can be fully integrated to chat room. Profile integrated: SocialEngine user profiles can be fully integrated to chat room. New! Avatar inregrated: SocialEngine users avatars can be transferred as well. New! SocialEngine helps people and brands build vibrant, customizable online communities. Launched in 2007, there are now 10,000 customers  of social websites powered by the SocialEngine platform, resulting in millions of end-users. The company currently has two platforms: SocialEngine Cloud and SocialEngine PHP. SocialEngine PHP is a PHP-based white-label social networking service platform, that provides features similar to a social network on a user's website. Main features include administration of small-to-mid scale social networks, some customization abilities, unencrypted code, multilingual capability, and modular plugin/widget compatibility. There is a range of templates and add-ons available to extend the basic features already included in the SocialEngine core.